Dr. Jean Layton-Gluten Free Doctor: Pop, Pop, Popovers! popovers GLUTEN FREE! YIPEE!!! !, originally uploaded by drjeannd. I have never been sure why an Irish-Catholic family decided to have a classic British Christmas feast, but that is my family's tradition. Perhaps its because my father HATED turkey, perhaps Mom just wanted a change. All I know is that for as long as I can remember, we have had a wonderful beef roast, popovers, mashed potatoes, plum pudding complete with hard sauce, and when my mom was the cook, lots of slightly overcooked vegetables. So now we are gluten free and I wanted to keep up the traditions, except for the overcooked veggies. The Beef roast was not a problem. One of the roasts created from our grass fed gift was a standing rib roast. Mashed potatoes are blissfully gluten free naturally. Thank goodness our family seems to be able to digest the dairy! But the popovers, what to do about them? Ethereal, crisp little sprites waiting for the gravy, how? I had the cast iron pan, seems like my mom made sure all of us got one of those. So at least I had that lead on creating them, but what about the batter? When in doubt 'round my house, I reached for my trusty 1946 edition of The Joy of Cooking. Another gift from mom, we kids(all six of us) each left the house as teens or young adults with a copy in tow. My mom didn't like any of the changes made by Ms. Becker when she started to "help" her mom out. So we all have Ms. Rombauer only vintages. 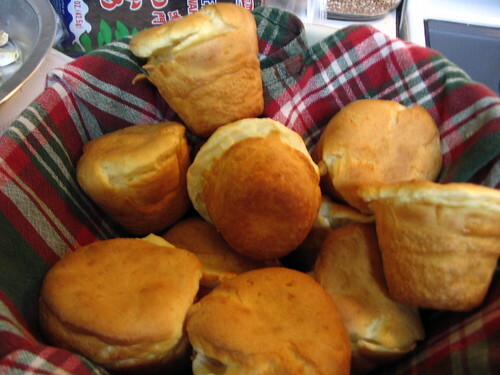 For anyone not familiar with popovers, they are created in a hot oven by pouring a pancake like batter into greased and heated cast iron or custard cups. The intense heat of both the cups and the oven allow for the puff. Together it creates a shell of crunchy, crispy dough and a soft and delicately stranded interior. Scrumptious! To enjoy, you break one open, fill the insides with gravy and eat as many as your body can hold. Leftovers (a rare but possible treat)are wonderful for breakfast with jam in the middle. Rombauer's recipe starts out with a lovely vignette of a young woman rushing up to her to say that "They popped". That is exactly what I wanted so I changed the ingredients to be gluten-free but not her method. THEY POPPED! YIPPEE! My daughters even demanded a new batch the next day for breakfast. You know it isn't all that difficult to mix a batch up for breakfast. These are now part of our Saturday morning breakfast rotation. Preheat oven to 450. Heat cast iron pan for at least 10 minutes in oven. Oil each cup. Beat together mix for at least 2 minutes. Pour in pre-oiled pans. Bake in oven 20 minutes or till popovers pop and brown well. Enjoy with gravy or jam.